Devastating storm damage to the hard luck ship New York left her without a fore topgallant mast, topsail yard and the skysail yards on the foremast were blown awayâplus the mainmast was left without sail. The increasingly nervous crew, whose first mate lay in his bunk seriously ill, felt certain they would never see San Francisco, and to each other they confided their fears that their lives would end right there on the high seas. âIt took many hours hard work to get things straightened out,â? crew member Paul Scharrenberg wrote in 1901, âand as there were no extra spars aboard, we had to let her go under the new rig with a skysail on the mizzen and lower topsail on the foremast. Her steering had been bad enough before, but from that night the good ship could not be made to readily respond to her helm.â? Gales beat up the New York until she reached Southern California, where the winds quieted down. âIt continued this way until Sunday morning, the 13th of March,â? Claire, the ship captainâs daughter recalled, âwhen we found ourselves in the vicinity of Half Moon Bayâ¦Then a northerly wind came up, and the seas became turbulent again, swinging wildly about a ship that would not answer her helmâ¦â? They were only one day away from San Francisco harbor, Captain Thomas Peabody assured his frightened daughter. Comforted, Claire slept an hour in her bunk until loud voices and strange noises woke her up. The New York shivered and shook, glassware hanging in racks on the cabin wall crashed to the floor, wildly swinging lanterns flickered out. Claire was consumed with fear as she bolted out of bed, calling for her mother. Together they scrambled up the companion way, opened the door and stood frozen in terror. âJust then,â? Claire tells us, âa gigantic wave rolled over the ship, and she lurched wildlyâ¦â? âGet below, both of you!â? shouted Captain Peabody. âStay there until I come down to you.â? Two hours later Captain Peabody slipped below deck and told his wife and daughter they were aground on the sands of Half Moon Bay. When the full moon rose, he said, he planned to order the lifeboats lowered, rowing everyone to safety through the churning surf. 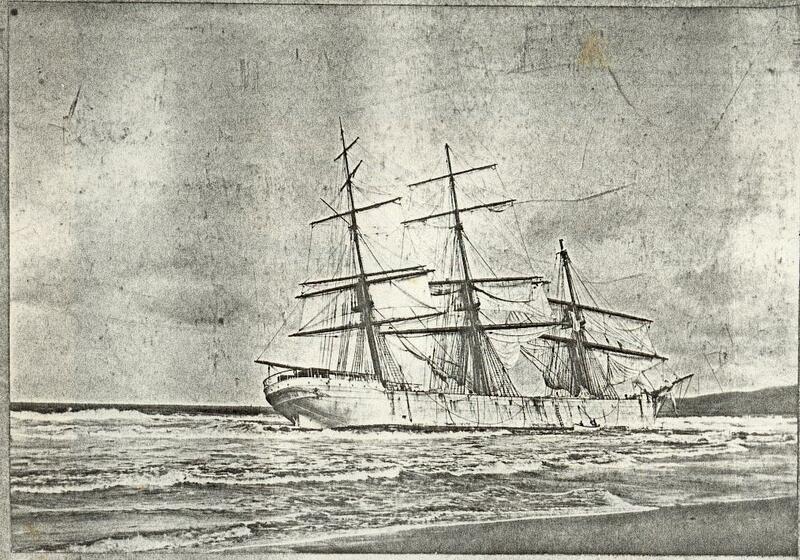 All day the people of Half Moon Bay had watched the twitchy movements of the ship from the beaches. Some carried whiskey, waiting on the sands near the foot of Kelly Avenue for the outcome. At 1 a.m., First Mate Callip, still suffering from a bad âcoldâ?, and in charge of seven seamen, swung a lifeboat from the davits. Captain Peabody placed his daughter and wife in the stern of the small craft and the men were ordered to pull away from the ship. But as they neared shore, the strong undercurrents capsized the boat, tossing its occupants into the frigid waters. When the Coastsiders saw the boat capsize, they formed a human chain, wading out into the turbulent waves, reaching for Claire and her mother, bringing them safely ashore. As mother and daughter huddled around a blazing bonfire eating steak provided by the kindly townspeople, First Mate Callipâs impulse was to rescue those still aboard the New York. But he couldnât get help from the sailors who now were too drunk from drinking whiskey to rescue their shipmates. 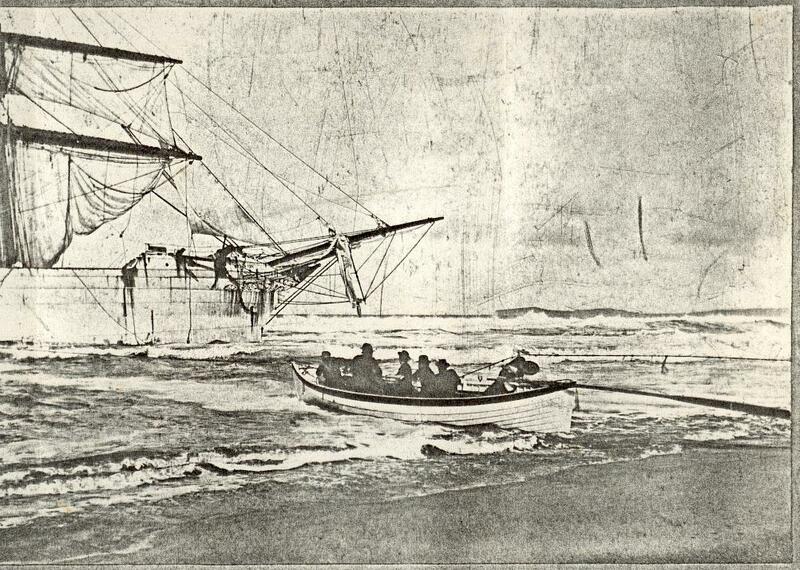 Finally, a second boat was launched from the New York, bringing ten more seamen ashore. But during the launch the cook, Ah Lee, caught his leg in the craft, fracturing his knee. As was maritime custom, Captain Peabody was the last to leave the ship.